Ask your guests to bring a long a bake each, or get busy in the kitchen cooking up a storm for the big day and ask for a donation in return for a delicious treat! You can make your bake sale even more interesting by giving out awards for different baking categories – like best themed, best tasting cake, healthiest option, and the absolute show stopper. 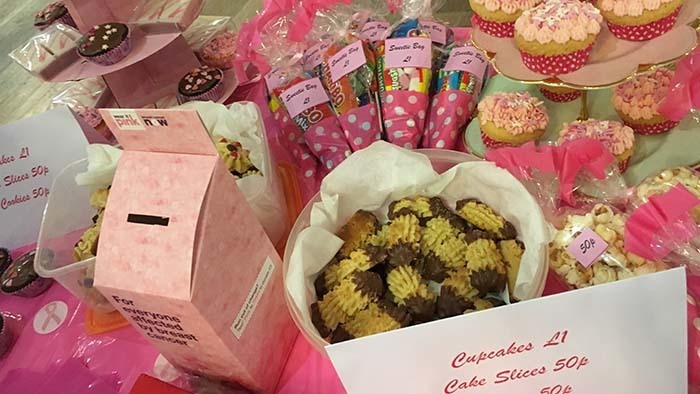 It’s a great way of getting your friends, colleagues or school together for some fun, and supporters have told us that it’s hands-down the biggest money-raiser of their wear it pink day. We suggest mixing up the bakes to make sure everyone can take part. It’s nice to treat yourself with a delicious and melt-in-your-mouth Victoria sponge – but why not try something that is healthier, or a savoury option for those who don’t have a sweet tooth? Packet mix, store-bought or your great-great-grandmothers recipe; however you do it, bake it your way, and help us make life-saving research happen. Don’t forget the most important part: every time you sell a cupcake, take a bite of that lemon-drizzle, or drop a coin into the collection box - you’re making a huge impact. If you’re looking for some particularly pink bakes, head over to our Pink Treats Pinterest board where you’ll find lots of cake ideas. You’ll also find tonnes of deliciously healthy recipes too that are pink and good for you!